How Is A Custom Flag Made? Custom flags can be made using a variety or combination of printing and sewing processes. Each process offers a different look and feel to the finished custom banner or flag. Here, we'll review some of the most popular custom flag processes so you can understand your options and choose the custom flag type that's right for you. Printed Flags are usually either digitally printed or screen printed. Digital print is the newer method of flag printing. 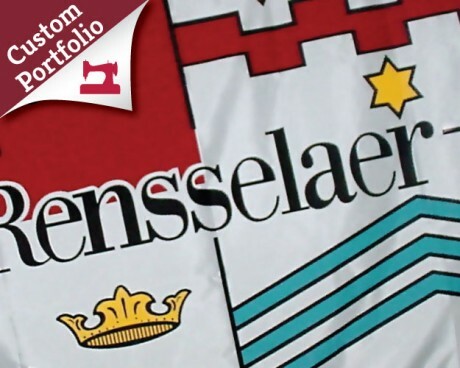 This process creates full color designs using an inkjet printer with special inks. The printing can be done directly onto the fabric, or onto paper, and then transferred to the fabric. Almost any flag can be made through the use of the digital printing process. Flags can be printed single or double sided, and can be any size. Digitally printed custom flags can be used outdoors, or they can be displayed indoors. Think a digitally printed flag might be right for you? You can learn more about custom digitally printed flags and request a quote for one here. The screen print process of making flags is falling by the wayside due to the more efficient, faster method of digitally printing an image onto your custom flag. It is still used for large quantities of the same design, as long as the design is fairly simple. When a custom flag is screen printed, different colored inks are layered onto fabric using a screen. The colors come out bright and bold, but it's important to keep in mind that this specific flag printing process works best for designs that feature only a few colors. Interested in learning more about screen printed flags and banners? You can find more information about custom screen printed flags here, plus request a quote for the creation of your design. Sewn flags are made with either applique or embroidery processes. The finished applique custom flag looks a bit like a quilt, in that each element of the design is a separate piece of fabric. Ours are typically made using nylon material. Applique flags seem particularly luxurious, as each component and detail is hand sewn onto the background of the flag or banner. While they are a bit more expensive than printed custom flags, applique flags are very high quality and are particularly impressive to look at! Want more details about applique flags? 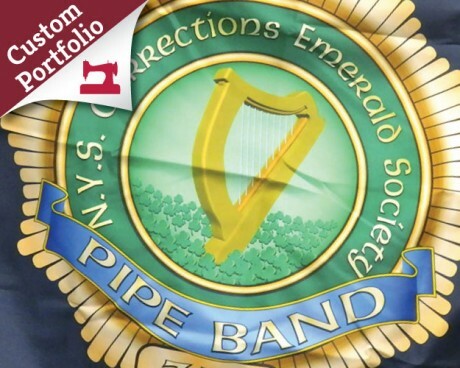 You can Check out our portfolio of custom applique flags here and request a quote if you're interested in designing your own. Embroidery uses a variety of thread colors to create a design on a single piece of fabric. Custom embroidered flags are beautiful in a similar way to applique flags, but can accommodate much finer designs and have texture to each element. Both are lovely for indoor flags or parade banners where the viewer can look closely at the flag or banner. We keep a wide variety of colors on hand to create beautiful designs out of fabric, whether you choose to go with an applique flag or a fully embroidered flag. Curious about embroidered flags? 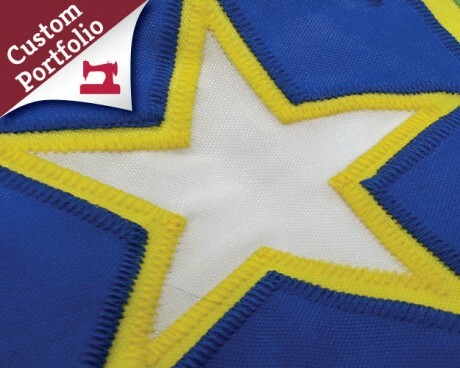 View our portfolio of custom embroidered flags and banners here, and request a quote for your own embroidered flag design. Gettysburg Flag Works offers all of these processes for making your custom flag and will be happy to offer advice on what will work best for your design and display location. Keep in mind that sewn flags are a little bit more complicated to quote than printed flags. To properly price the new flag, we'll need the finished size, and the artwork that will be sewn onto the flag. We will also need to know just how big the artwork will be on the flag. 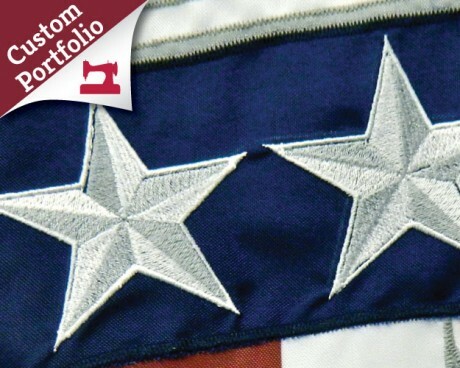 Embroidered flags are quoted based on the number of stitches required to recreate your artwork. Applique flags and banners are priced based on the number and sizes of the elements of the design. Ready to order your custom flag? Gettysburg Flag Works is here to help you with the process of ordering your custom flag or banner. If you are interested in getting a custom quote now that you've explored your custom flag process options, call us or use our custom flag quote form to get the process started. Simply send us your design and details, and our helpful sales staff will work up a quote for your new custom flags. Have questions or need additional information? Give us a call at 1-888-697-3524 and we'd be happy to talk you through the process!